Are you ready to get started on some digital SLR camera comparisons? Before you jump in, it helps if you have some idea of what you love to photograph and what some of the camera jargon - like megapixels, ISO, live view and image stabilization - means. Why? Because this knowledge will make your digital SLR camera comparisons 100 times easier. Are you an action or portrait photographer? What are dust control and live view? If you're not sure about question one, then take some time to think about what you love to photograph. If it's question two that has you stumped, then take a quick refresher course in digital SLR terminology. If you know the answer to both, then keep reading to discover the easiest way to make your digital SLR camera comparisons. Let's play a matching game. It's fun, and the goal is to save you time. 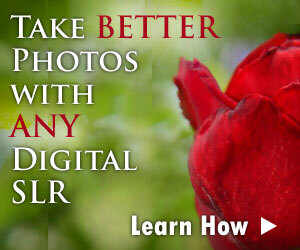 If this works, you won't have to compare every digital SLR camera on the market, just a few. Do you remember the one you identified with? Did you write it down? If not, go back to Step 1 right now and decide which one best describes your photography style. Don't worry, I'll wait. Got your photographic style? Good. In the following table, the photographic styles are on the left, and the most important camera features to look for are on the right. Find your style, and you'll see just what features you need in your digital SLR camera. This process should make your digital SLR camera comparisons significantly easier. Any digital SLR camera is compatible with more than one photography style. Find a camera that matches your primary photographic need first, and then see how well it works for other photography styles. Example: if you enjoy action and sports photography, consider the best digital SLR for action. This camera will also take beautiful landscapes and portraits, but if you purchase a slower camera you might be disappointed with your action and sports shots. Now you can really begin your digital SLR camera comparisons. You're not only informed about your photographic style, you also know exactly what features to look for. If you go this route, you need to select the one camera feature that's most important to you. Maybe it's the speed of the camera, or how much it costs. Whatever the defining feature may be, there is probably a digital SLR out there that will match your needs. Megapixels - if you're positive you want to print at large sizes, then you need a camera with a lot of megapixels. Cost - don't have Donald Trump's income? You might be looking for an inexpensive digital SLR. Ratings - find out what others think and which digital SLR gets the highest ratings by users. Size - when you don't want to lug around a brick all day, a small-sized digital SLR is ideal. Special Features - looking for a DSLR that captures video? This is one of many several special features. This approach to digital SLR camera comparisons is for those who only want the best. Let me say this first: the best is relative. The cameras that I present in this section are my choices as the best digital SLRs in each category. No panel of judges was involved. I justify my "best of" camera choices in detail, so you can see how I reached my conclusions. If this approach is helpful to you, then find out what's the best digital SLR camera. This technique is for those who like details. Rather than finding out what I think are the best cameras, or deciding ahead of time which feature is most important, you'd like to find out the specifics of each digital SLR camera. That's what the in-depth digital SLR camera guides on this site are all about. They'll walk you through all of the camera features, and identify the pros and cons of each one. You'll get to see plenty of photo samples taken by the camera along the way. Once you're finished with a digital SLR camera guide, you'll have a much better sense of whether or not the camera is the best digital SLR for you. It's my sincere hope that you can now complete your digital SLR camera comparisons with ease. Comparing digital camera features can be a slow and painstaking process. With any luck you've just eliminated half of the models to consider. And just think - once you get done with your digital SLR camera comparisons, you can go ahead and buy it. If you're used to film SLR or digital compact cameras, a digital SLR will be a whole new world of fun for you.